The mission of Positive Impact New York, Inc. is to develop tomorrowâ&#x20AC;&#x2122;s leaders by preparing them for life in high school , college and beyond. Greetings and happy holidays from Positive Impact New York! This year-end report details our accomplishments in 2012 and looks forward to the future as Positive Impact New York continues to build on the success from last year. In the following pages, you will see the results of the hard work and dedication put forth by our staff, families and the community.! In the following pages, you will see the results of the hard work put forth by our organization and participants. You will also read about the tireless efforts exhibited all year long by our amazing supporters.! In 2012, we re-structured our program focusing on our “Positive Impact Projects”. The Positive Impact Projects consisted of three components: The Positive Impact Basketball Academy, The Blackboards and Backboards Student-Athlete Academy, and the Capital District Classic. The Basketball Academy will provide skill development to student-athletes throughout the Capital Region from k-12 through rigorous basketball workouts designed to improve each player’s overall skills. The Blackboards and Backboards Student-Athlete Academy hosted 24 student-athletes in grades 6-8 with basketball skills and life skills workshops to assist them in the college recruiting process. Last but not least, the Capital District Classic provided a platform to the top 40 junior high players in region in an all-star game setting. By expanding our programs, we not only improved our community base, but more importantly provided more meaningful outlets for our youth.! In 2013, Positive Impact New York’s 10th anniversary, we will look to continue to improve ways to develop tomorrow’s leaders. To do this, we need your help. Whether it’s volunteering at our Blackboards & Backboards Student-Athlete Academy, or sponsoring our Capital District Classic, we will continue to scale Positive Impact New York with your support.! I wish you all much happiness, great health and success in 2013. I am fortunate to serve you and our youth!! BRIGHTER CHOICE MIDDLE SCHOOL FOR BOYS! GREEN TECH CHARTER HIGH SCHOOL! SHAUNTIA VERONA! SAKYNA COLEMAN! JONATHON THOMAS! DERICK BROWN! DARRYL WILLIAMS SR.! NCAA CLEARINGHOUSE NIGHT! Positive Impact New York, Inc. will be hosted a National Collegiate Athletic Association (NCAA) Clearinghouse Night designed to familiarize Capital District student-athletes and their parents about NCAA academic standards for Division I and II schools.! BLACKBOARDS & BACKBOARDS STUDENT-ATHLETE ACADEMY! 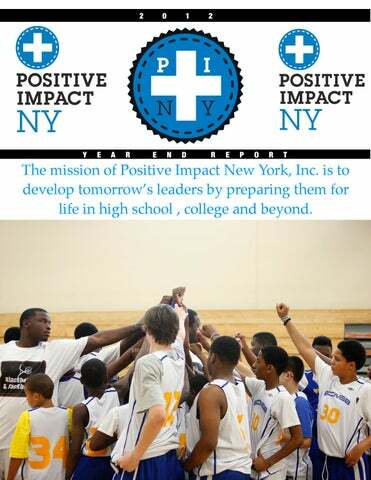 Positive Impact New York, Inc. hosted its inaugural Blackboards & Backboards Student-Athlete Academy.! The purpose of the program is to encourage participation in sports, as a way of! encouraging and advancing excellence in academics. Jason Greco, the Compliance Developing constructive Coordinator at Siena College personal goals and providing an gave a workshop as well as extended family to assist our answer any questions you might student-athletes in becoming have on this very important valuable contributors in their! topic.! communities by identifying the requirements and opportunities in the Higher Education process early in the academic timeline of the individual. CAPITAL DISTRICT CLASSIC! Positive Impact New York, Inc. created “The Capital District Classic” to give Capital Region student-athletes a platform to showcase their talents. Some of the area’s top basketball players will participate in this annual event that promises to be around for years to come.! Positive Impact New York hopes that “The Capital District Classic” will ignite the energy and passion of youth basketball in the Capital Region and bridge the gap between the Capital Region’s basketball legacy and the current youth basketball experience while providing an improved platform for competition and exposure. We at Positive Impact New York are committed to developing the total student-athlete. Jelani Currie is the epitome of the total student-athlete. Jelani played at Albany Academy in Albany under Brian Fruscio. He was named all-area his final two seasons on the court. As a senior, Jelani averaged 22 points, eight rebounds, three assists, two steals and two blocks and led the Cadets to a 14-5 record. He played his AAU ball for the Albany City Rocks under Jim Hart was also was a standout in track and field and football at Albany Academy. Jelani was twice the state champion in the triple jump, the New York State Federation champ in the event as well as a first team all-area wide receiver in football. Jelani is a great example of a young man who was focused and committed to his goals. His focus turned into a full scholarship to Texas A&M Corpus-Christi.